If you are like me, you looked at that picture and said WOW, her makeup looks great. It is not too much but her skin and face look flawless! I wonder what kind of foundation she wears? Well ladies...that is one question I get asked most about. My foundation! And because I love you so all dearly, I want to share with you the products I use. Let's face it, we all love our makeup looking flawless. These are the products I use each day to achieve my look. Everyone has a different skin type. My skin is not oily and it is not dry - a good combination of both. I rarely have break outs. I put it on at night and can tell it has really made my face silky smooth. This also helps when applying foundation. It goes on much more evenly. I went to the Bobbi Brown counter and asked for a few samples to make sure I liked it before spending all that money on a product I wasn't sure if I would like. When I am out of my samples I WILL be buying this. Or I might be going back for more free samples. What?! I know you do that too!! I think I woke up one day and realized I'm getting old! Okay, okay, I am 24...but it is never too early to prevent the inevitable wrinkles and dark under eyes. I have always heard good things about the StriVectin line and came across an amazing deal at none other than TJ Maxx. However, this tube will last me a good while.... So time will tell on this product. Foundation is important because it is what sets the rest of your look. I found my all time favorite foundation about 5 years ago and have never even wanted to try anything else. 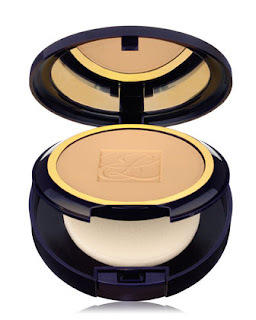 I'm talking about Estee' Lauder Double Wear Foundation. This is a thicker foundation and literally lasts all day long. I can wear it to work, work out and even for a night out and it always looks fresh. 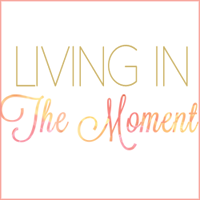 I have also gotten my close friends, family and even many acquaintances hooked on this product. Ladies, if you have not tried this yet, go to your local Estee' Lauder counter and get them to match your color and give you a sample. For those of you that aren't used to a heavy foundation they also make a lighter version. 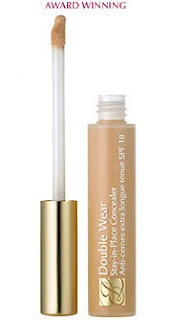 For those annoying dark circles under your eyes or any blemishes you need covering, this concealer does the trick. I also use Estee' Lauder Double Wear for this too. This product isn't thick or cakey like some concealers. It also stays in place and lasts for hours. Not to mention this tube lasts ridiculously long. I like to use a pressed powder vs loose powder....really because I don't like the mess loose powder leaves. I apply my powder with a brush instead of the sponge it comes on with for a less heavy look. Again, I use Estee' Lauder. I'm obsessed with the Estee' Lauder Double Wear line!! Now go link up with Lindsey for your favorites! 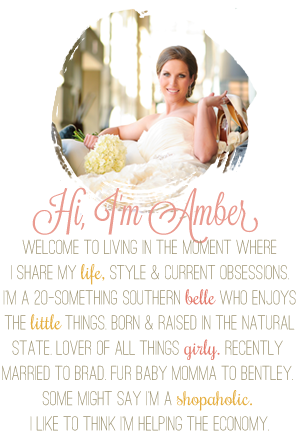 Hey girl - just found you through the Link-up. 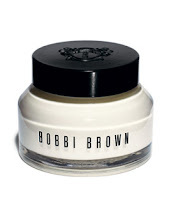 This is a great post, I need to try the Bobbi Brown moisturizer! I'm now following! 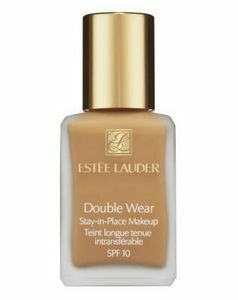 I used to work for Estee Lauder and you really can't be the double wear foundation...You made me want to go back to wearing it again! i love all things bobbi brown! haven't tried the eye cream yet but its looking like it might be a must. have a great weekend! i really want to start wearing make up more. i just have never cared, but sometimes when i'm going out for a "big night" i wear eye makeup and lip stuff but i never knew how to do foundation and i think it could make a big difference! 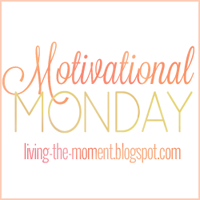 so i'm definitely loving hearing about all the different kinds of foundations people use! thanks for the suggestions! i also just started wearing night-time moisturizer + eye creams (turned 27 on monday! gahh!!) and while i cant tell a difference with the eye cream (maybe it just prevents more wrinkles??) the nighttime cream makes my skin feel wonderful!! i dont like regular lotion because i feel like it leaves a sticky lotiony feel, but i looove moisturizer! lol .. .now that i've left a novel! have a great night! I love hearing about what kinds of makeup people use. You're tempting me with your rave reviews of Estee Lauder, though I'm pretty attached to Bare Minerals. I'm all about trying new kinds of makeup though--if only it weren't such an expensive hobby! I have been using clinique makeup for about 6 months and I love it but now I want to try estee lauder! I just may go get matched. What about lipstick? I have the hardest time finding a good lipstick.